Leading software provider, Wazdan proudly announced the launch of its newest slot: Magic Target Deluxe. Those players who are acquainted with Wazdan’s products probably remember the first version of this colourful game. Now the well-known game appears with a completely new look offering fantastic sounds and graphics together with even more entertaining gameplay. 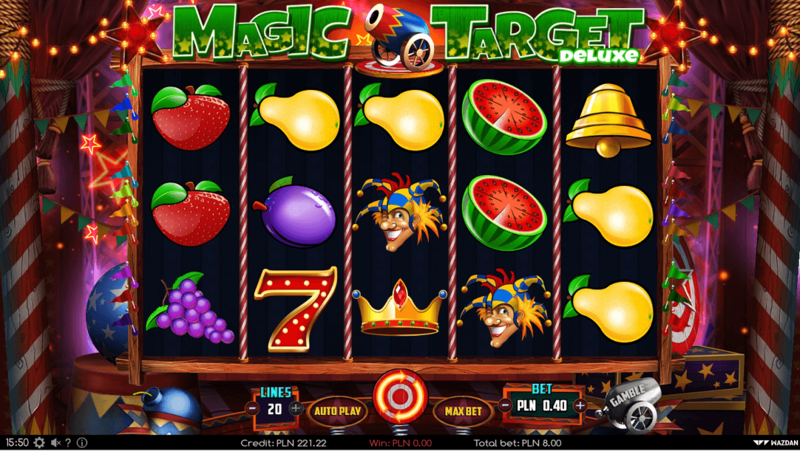 The 5-reel 20-payline Magic Target Deluxe slot takes players into the centre of a mysterious circus arena where everyone gets a chance to enjoy crazy entertainment shows with firing of the real cannon as one of the main attractions. Besides the attractive look, Magic Target Deluxe is able to provide players with nice winnings as the game is packed with interesting special features including free spins, wilds and multipliers. Exciting gameplay available in the slot is accompanied by stunning high definition graphics, beautiful animations and an excellent soundtrack. As all Wazdan’s slots, Magic Target Deluxe was built in HTML5 and is available on both desktop and mobile devices.